Volunteering has always been something I wanted to do one day. But it has repeatedly just been that; one day.. I never really knew where to start. So after having left university in September, and somewhere in between the struggle of finding a job, not really knowing what I want to do with the rest of my life, I realised the timing was perfect for that something out of my comfort zone I've always craved. While I loved my life in London, I just wanted a break before jumping into the professional life, and extend myself to other opportunities. I started spending more time researching how I could make a difference and travel at the same time. Many volunteer organisations popped up on my browser, and even so many destinations that I could chose from. I decided to go for the Rise Above Foundation in Cebu, The Philippines, a comparably small, local organisation striving to help improve the quality of life for the poor and underprivileged by providing educational opportunities, livelihood training, and health and hygiene programs. A couple of weeks later, I was about to hop on the plane off to the Philippines. And words to not speak enough, they made me feel like a part of their family from day one.. I chose to volunteer in the community center located right next to a depressed area in Guadelupe. Underprivileged children from the surrounding slums come here to learn by reading, playing and even singing. They love to learn and play, and coming to the center every day is something totally rewarding for them; parents were just not in the position to supply their kids with opportunities like this one, plainly because of poverty. These children often come from extreme poverty and they seldom have more than one meal a day, sometimes not even that. But it is thrilling to see the excitement in these kids when they join in on the activities I planned. They love coming to the centre, so much that it's hard to make them leave at the end of the day. And let's not talk about us taking a day of rest; the children would just peek underneath the gate and call to be let in all day long. Next to the preparation and execution of the daily activities with the kids (Drawing, games, handicrafts, spelling exercises, excursions and help with their homework, to name a few) I took over the challenge of painting a mural from an amazing couple, volunteering at the centre and designing it with the help of the children before I arrived. It was amazing seeing the design come to life starting from a plain white wall. 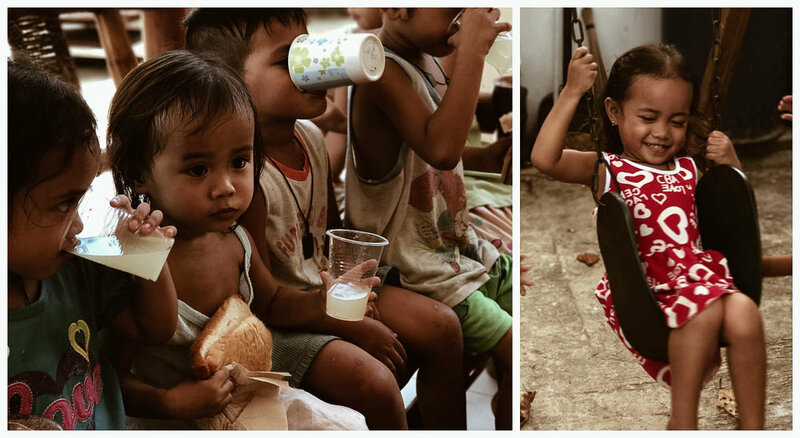 With the money I have raised thanks to my amazing donors, I have not only been able to sponsor a hot, nutritious meal ("lugaw") for 500 children, but also provide them with Christmas gifts, and even take some of the children out on a day trip to the beach. Little goes a long way over here! Thank you at this place for all the people that have donated to my fundraiser. Europeans can certainly learn a lot from Filipinos. They're the most friendly people I've ever encountered, and, especially the children, give off such a happiness, being it in the city or the more separated slum area, where, sometimes, people do not have anything but themselves and their families, which are, more often than not, even torn apart as many mothers have been left on their own by their partners or an illness or unfortunate event caused a family member to pass away. At first, I found it really odd and felt a bit ashamed people would stop their work or play to wish me, as a passerby, a good morning. But the friendliness between the people and towards me, as a "white" foreigner in a non-touristy part of the city, is just impressive. I came to Cebu with time, energy and dedication. What I take back home with me is not only new friendships and another stamp on my passport; no, I will take along a suitcase full of emotions and memories of a wonderful experience. Children of Sambag II, you'll always have a special place in my heart.